- Control and management of masterbatch consumption. 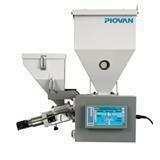 - Elimination of dosing variations: high level of accuracy and repeatability. - Wide range of capacities. - Straightforward user interface with 7" touch screen. SCADA stands for Supervisory Control and Data Acquisition. As the name suggests, it is not a full control system, but rather focuses on the supervisory level. As such, it is a purely software package that is positioned on top of hardware to which it is interfaced, in general via PID controllers, RTUs or other commercial hardware modules. We are one of the noted service providers of a wide array of services that includes PLC Programming Service. The PLC Based Control Systems offered by us facilitate ease of installation and require negligible maintenance. We offer an extensive range of PLC & SCADA Systems that consists of engineering stations, work stations, database servers, operators console, scada servers/clients remote programming and redundant servers. The range allows various clients to develop hi-tech screens for their applications utilizing easy configurations parameters and tools. We manufacture advanced technology based Programmable Logic Controller System (PLC) and Supervisory Control & Data Acquisition (SCADA) based industrial automation systems. These systems are in compliance with various industrial standards and are used in machines manufactured at our end. We also design these systems as per the specifications detailed by our clients.